My association with health sciences libraries did not happen by design, but I now consider it a happy accident. I have always loved history. I knew from the moment I started library school at the University of Pittsburgh, I wanted to be a special collections librarian. Getting my hands on old books and being able to talk about history all day sounded like a dream come true. More than seven years after receiving my degree, I now realize that some of that dream was a bit of student naïveté. But I am lucky enough to oversee a world-class medical history collection. I never thought that I would end up at such a venerable institution as the Historical Medical Library of The College of Physicians of Philadelphia, and especially not so early in my career. The best part of my job is that I truly get to do a little bit of everything. My days are almost never predictable. I am on the front lines of public service. So I have extensive interactions with my patrons, which has helped me learn our holdings very quickly. 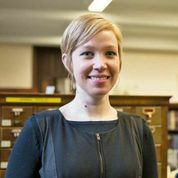 It is such a thrill getting to see the diversity of scholars who use our collection. Scholars from a number of disciplines can interpret the same book on manuscript material in myriad ways, and I am impressed every time by the meaning so many people can derive from the history of medicine. One of my accomplishments, of which I am most proud, is my expansion of our audience even more. Found in our books are not only medical lessons, but also art lessons. In Summer 2013, I invited artists to come sketch from selected works from the collection. Students who participated in these sketching sessions were then eligible to enter a juried art show, and the resulting pieces were better than I imagined. From paintings to monotypes, drawings to collage, the diversity of media and imagery in the art perfectly represent the diversity of our library users. Since the debut of the juried art show in December, I have seen a steady stream of student artists making appointments to draw from our rich anatomical atlas holdings. The opening of the art show was timed in conjunction with the celebration of the library’s 225th anniversary. We knew we could not let such a momentous anniversary pass by without marking it with a series of events, which is where a renewed relationship with NN/LM MAR came in. Decades ago, the College library was the Regional Medical Library. But since making the switch to exclusively historic collections, our link has been almost exclusively through our DOCLINE activities. 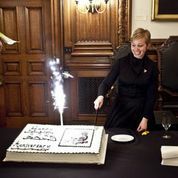 However, knowing that many medical libraries with historic collections are now in positions where they need to decide what to do with their historic material, we thought that a conference both celebrating our anniversary and addressing the importance of historic collections would be a great way to partner with MAR. Thanks to MAR’s generous funding, on December 6th we hosted the daylong conference Emerging Roles for Historical Medical Libraries: Value in the Digital Age. 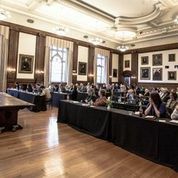 The conference featured a panel representing the academic and library fields speaking to a diverse audience of museum and library professionals, physicians, academics, and students. 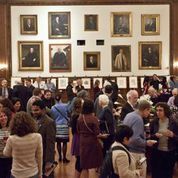 We hope that attendees left the conference feeling energized, with new ideas about the future of historical medical collections. The future of our own historical medical collection is looking bright. We are on the cusp of launching a digital image library featuring anatomical atlases, herbals, and an exhibit on a physician’s experience during World War I. Also, we are part of the Medical Heritage Library, under the auspices of which we are digitizing over half a million pages of early American medical journals. Our goals for the future are not solely in the digital realm, however. We continue to expand our reading room audience. I recently welcomed junior high and high school students working on their National History Day projects. In considering just how many different things I’ve been able to do and how versatile I have had to be since becoming the librarian at The College, I can think of no better advice to library students and new professionals than this: don’t feel the need to specialize, especially not early in your career. It’s hard to know what aspect of librarianship you’ll love doing until you actually do it. So try a bit of everything, and you are sure to be a better information professional for it.